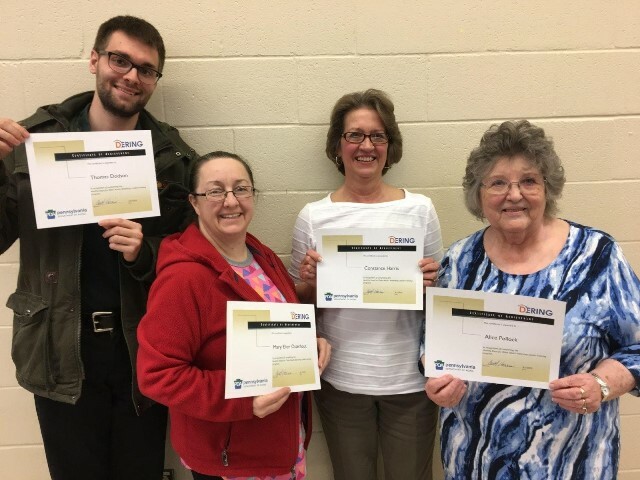 CLEARFIELD – Staff from the Clearfield County Area Agency on Aging Inc. attended the Healthy Steps for Older Adults Workshop Training Program at the Clearfield County Career and Technology Center in Clearfield. While at the training, they learned statistics relating to falls and fall risks, the different types of individuals who will be needed to facilitate the training, including a Certified Workshop Leader, General Staff/Volunteers, Spotters and Screeners, as well as the duties of each individual. They learned some key attributes to have when facilitating the class in order to get older adults engaged and interested, how to prepare for a class, understanding the materials needed and how long to prepare. Workshop one is designed to teach the older adults about preventing falls, what to do if you do fall, safety tips for their homes and their medicine and how to challenge your doctor when you are feeling uncomfortable with what they are telling you. In workshop two, they learned how to give a physical skills screening to determine what fall risk level an individual is at as well as learning fitness safety tips, several warm-ups, balance basics, lower body core and upper body exercises and several stretching techniques. This workshop is designed to get the older adults accustomed to several exercises they can do every day in many different settings. Whether they are standing in a line at the grocery store, cooking in the kitchen or watching television, they can do some of these exercises to keep their bodies strong and prevent falls. For more information on upcoming classes, please contact the CCAAA at 814-765-2696.